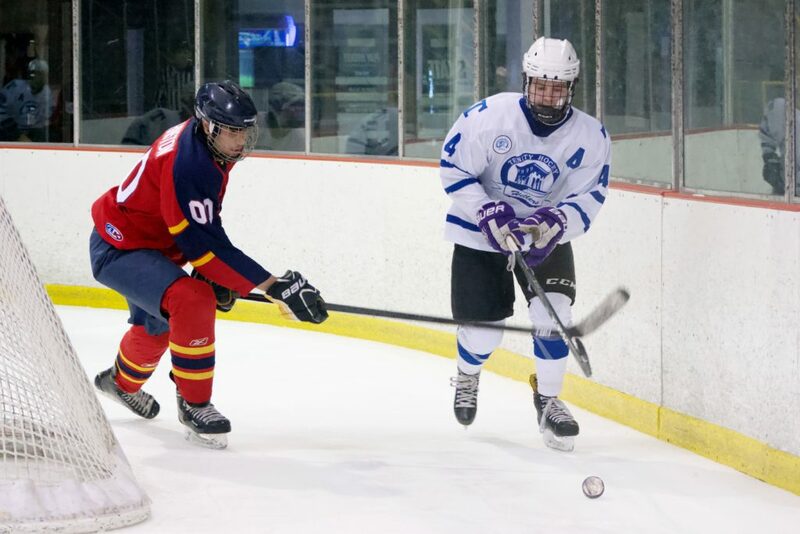 CECIL TWP., Pa. — Jack Hritsko scored two goals as Trinity erased a 4-1 deficit en-route to a 6-4 victory over Morgantown at Printscape Arena on Tuesday. Carter Kline and Quintin Smith opened up the scoring for the Mohawks, seemingly controlling play from the first draw. Hritsko cut the lead to 2-1 at the end of the first, but goals by Kline and Smith opened up a three-goal lead by the visitors. After a quick timeout, the Hillers came alive. Dax Kress, Garrett Gellner and Hritsko each went bar-down to give tie the game heading into the ice cut, with Hritsko’s goal coming with .5 seconds remaining in the period. After Corey Blommel’s penalty shot was denied by Sydney Smith, Cale Aloe found the net off of the ensuing face-off, giving Trinity the lead at 15:08 of the period. Blommel finished off the scoring at 16:57 with an empty netter. Trinity moves in to the No. 8 spot with the victory, and with having McDowell and Neshannock as their final two opponents have an easier time than the Knoch Knights, who have Neshannock, Carrick and Connellsville to round out their schedule.